Granite is an igneous of magma condensate below the surface. Its main component is feldspar and quartz. It is not easily weathered, hard and has beautiful colors, is the ideal paving aggregates and building stone and widely used in the construction field. 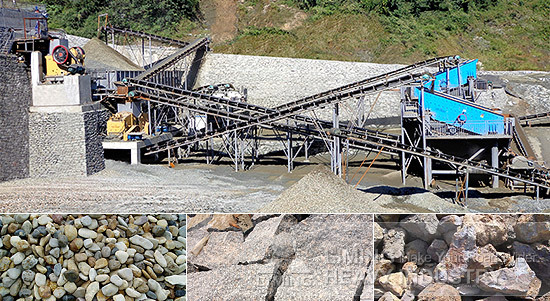 For granite, basalt, quartz, marble and other high hardness ore rock properties and application requirements, Liming Heavy Industry designed a set of granite processing program for customers, which including Jaw Crusher, HPT hydraulic cone crusher and VSI crusher. Wherein, the jaw crusher is applied for granite, basalt rock ore crushing, generally used for first crushing step. It uses the principle of mutual squeezing from jaws and materials to processing. Its high crushing capacity can one-time process all various of rocks to medium grain, running is stable. In the production of granite secondary crushing and shaping, liming Heavy Industry select new combination with HPT Hydraulic Cone Crusher + VSI5X Sand making machine to achieve further accurate processing. According to the technical engineer, HPT hydraulic cone crusher adopts hydraulic systems and laminated crushing principle, VSI5X sand making machine use impact energy, "stone to stone" "stone to iron" crushing principle, has high crushing ability, low wear, excellent finished grain shape, enjoy high praise in hard rock crushing areas, market feedback is very good.